When you’re five cups of coffee in and two papers behind, your mental health usually isn’t the first thing on your mind. In fact, it’s probably the last. Deciding who to vote for in the political race comes with a lot of questions: Who do I agree with? Do I identify with a certain political party? Who do I trust? In a national crisis, which candidate would do the right thing? On Feb. 26, Grand Valley State University's myGVSU Campus Climate Survey data began to be analyzed by the Division of Inclusion and Equity. The study collected student, faculty and staff feelings and thoughts about a range of topics, including how welcome they felt on campus and how happy they are to be part of the Laker community. 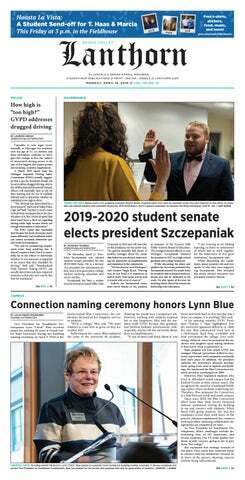 Recently, as seen in the article HEADLINE HERE, the Grand Valley State University Student Senate sent three senators to Lansing to speak with representatives about funding appropriations. I don’t care what you think about me, I just want you to think. Throughout history social change was spurred by a person who had an idea deemed to be unpopular, offensive or obscene. On Feb. 12, the Grand Valley State University Board of Trustees approved a construction plan for GVSU's Medical Mile expansion on the property that falls in the Grand Rapids neighborhood called Belknap Lookout. In Drew Howard's article, "New health campus plans approved amid controversy," the article elaborates on the deal reached between GVSU, the city of Grand Rapids and the neighborhood itself. When it comes to money, the traditional college student doesn't have much to spare. With record-breaking tuition costs looming and crazy high costs of textbooks, students' limited finances should be taken into consideration when administrators raise prices on campus. Every four years, the American electorate selects a new leader of the free world. There are no riots in the streets. There is no bloodshed. There are no political prisoners. Instead, millions of people flood to public schools, churches and city halls to cast their vote and make their voice heard. During the average college student's educational career, most will have to take a much-dreaded 6 p.m. to 9 p.m. class at least once. Though you don't see many students excited for these three hour blocks of class, time spent on class materials should be prioritized instead of compromised.